♦ Be prompt, that is, ready to practice or warm-up at the set time. ♦ Inappropriate language will not be tolerated. ♦ Each girl should listen, learn, and have a desire to improve through consistent effort while being certain to set realistic individual and team goals. ♦ If special circumstances dictate, arrangements must be made prior to the day of the game with the Athletic Department through the coach. ♦ Finally, players must be respectful to all referees, coaches, teachers, bus drivers, fans, spectators, parents — and especially, fellow teammates. Coaches are mindful or demands on student-athletes. But remember, a CIF sports such as lacrosse is just like any class – and requires similar dedication. Lacrosse is your period seven class and the coach will take attendance. If you are going to be late or absent, please notify the coach before the practice or the game. Excessive absences could also result in dismissal from the team. Injured athletes are expected to attend practice, but will only participate in appropriate activities. Ill athletes should notify the coach via email of their condition, but should not attend practice if they are contagious. Do your best in the classroom and realize that you are a role model because of your involvement with Girls’ Lacrosse. Player eligibility includes a minimum of a 2.0 GPA (a one-time waiver may be used, which provides eligibility for the quarter only). Players are encouraged to use the time before practice to complete their homework. THHS Student Handbook explains honor/ethics code violations. A second offense occurring during the probationary period results in the student being ineligible for sports. Any student-athlete, who successfully completes the lacrosse season, follows team guidelines, and fulfilled their role as a team member, will receive a certificate of participation. Varsity Letters will be awarded at the discretion of the head coach. Bring required equipment to all games and practices! Wear appropriate clothing! This includes sticks, goggles, mouth guards — uniform for games and a reversible pinnie for practices. (Uniform and pinnie are provided to every player.) Water is a must, too, for player’s health! ♦ Proper sports attire (navy blue or black) is to be worn under the kilt and jersey. A long-sleeved black T is provided to every player. ♦ Long-sleeved leggings, if worn, must match be black or navy blue. ♦ Socks that look like team socks or low or no-show styles. Be sure your student-athlete is getting to team events on time with proper/clean practice clothing and/or uniform. Make an effort to attend as many games as possible – home or away — whether or not your student-athlete is a “starter” or earns very little or no playing time. At the games please cheer for our team — never against the officials — and honor the game of lacrosse. If your student-athlete has a concern — encourage her to talk to her coach directly. If you have a concern with a coach’s decisions, please email Head Coach Scott Leong (scott.leong@meggitt.com.) If need be, a face-to-face meeting can be arranged. Thank the Trabuco Hills administration (Principal, assistant principals, custodial staff, etc.) every opportunity you get. 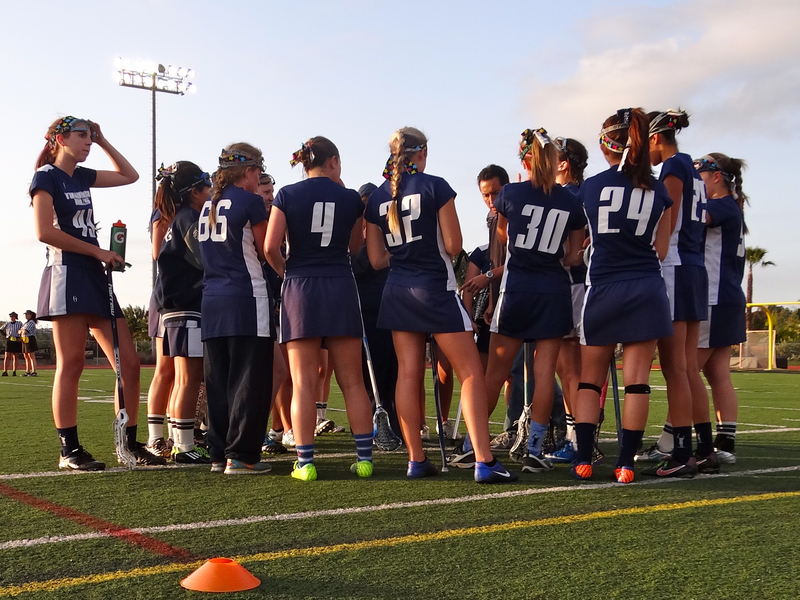 Please volunteer for committees or other support efforts for Trabuco Hills Girls Lacrosse. Consider off-season training programs – whether it be Mustang Lacrosse Club or other organizations., Off-season training is not mandatory, but is certainly invaluable to a girls’ player development. Start practice on time — end practice on time. Parents should be ready to pick their student-athletes up on time as well. Coaches will adhere to school, CIF, and US Lacrosse policies to maintain a safe and fun learning environment for lacrosse. Our intention is to coach every player on the team and set high expectations for every player. Finally, we will coach the team with the goals to learn, have fun, and win. Also, have you sign your player agreement?